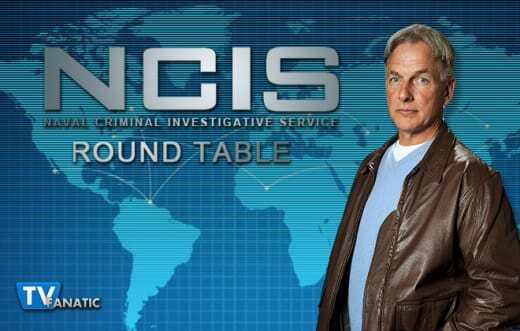 Tony left for Russia, while Vance and Fornell tripped on over to England in their joint effort to bring down an assassin who's targeting NCIS agents. Meanwhile, Gibbs and the rest of the team stayed at home as they hunted down a drug trafficker who was trying to kill a young witness to a murder, on NCIS Season 13 Episode 22. David: The mole hunt goes global! Kathleen: Those that are left behind. David: I thought every scene with McGee and Henry was incredibly well-done. Tim was just the right person to work with him because of their shared experiences. He showed perfect compassion and was kind-but-firm in coaxing the boy back to his mother after he ran away. McGee would make a great dad...and certainly a great uncle!!!! Sorry to all the DiNozzo fans, but Tony would have blown it big time. Kathleen: For me, the best moment came when McGee explained to Gibbs what it was like for the family members of members of the military deployed overseas. Christine: I agree with Kathleen. I loved that McGee was able to give Gibbs, and the audience, the perspective of how difficult it is to be the family left on the home front and I think his conversations with Henry really drove that home. Doug: I loved every scene with Fornell. I especially liked it when he tried to school Vance on how to talk to the locals, only to have them all stop talking as they turned to stare at him. Was the case of the week interesting? How so? David: Assuming you're referring to Henry's case, I wasn't thrilled that he initially lied about the nature of the crime. Also, when he couldn't identify either of the two recent victims, I thought, "He's about to come clean about another lie," but I was wrong. Now skip to the end where the officer used her own computer to access traffic cams in tracking Henry. Please! Did she think she wouldn't get caught? Kathleen: No, she didn't think she'd get caught, David! Heh. What I liked best about the case of the week was the window it gave into the lives and struggles of the families of members of the military on deployment. It even gave McGee a chance to shine, especially when he showed to Gibbs (the guy who usually knows everything) that McGee had a unique and valuable perspective on the situation. Christine: I liked the case with Henry, even though it got a little convoluted with him seeing the drug dealer commit murder. I also liked Fornell and Vance in the UK but I think I enjoyed them together more than I enjoyed the case itself. Doug: I found myself invested in Henry and his serious coping skills. The guy was under pressure all the time. It might not have been fair, but he certainly represents some of the angst military children go through, in terms of called on to help while Dad or Mom is gone for six months. What are your thoughts on the NCIS mole? Any ideas who it might be? David: It's probably someone we've seen briefly and dismissed just as quickly. Frankly, the only character in recent memory with the means to access the information is Bishop's estranged husband, but I could be way off. By the way, both NCIS and NCIS: LA now have story lines involving a mole. On NCIS: LA, the story's been on the back burner, but after the season finale, which aired this week, it's likely to come into the forefront next season. If we don't find out who the NCIS mole is by the end of this season, there's the theoretical possibility of a crossover episode in the fall. Kathleen: The fact that NCIS has yet another mole in the ranks makes me want to throw the entire HR department there in jail for obvious sabotage of a federal agency. This is getting ridiculous. Christine: Jimmy Palmer. Yeah, I’ve got no clue who the mole is. I’d kind of hate it if it were Bishop’s ex, Jake. That just seems mean. Doug: I would love it if Jimmy Palmer turned out to be the mole. It would make all of the viewers look at their TV screens sideways. Making him into a bad guy would be a transition to a serious Game of Thrones dynamic, where no one is safe! But yeah, I really have no idea. What did you think of Michelle Obama on this episode? David: I liked how accessible and committed she seemed. Just curious: has there been press about her being a fan of the show? Kathleen: I have no opinion about the First Lady herself, but it was nice of her to promote a good cause like Joining Forces. Christine: I loved that they got the opportunity to promote Joining Forces. I’m not sure that any other show has been invited to film at the White House with the First Lady, so that’s pretty cool. Doug: I thought it was cool that Glasberg's first thought was to promote Joining Forces, not getting Michelle to star. That just came after. I thought she did a great job too, and am glad that her presence was all about the initiative, rather than just displaying her star power.